(CN) – Many of the 5,800 troops President Donald Trump deployed to the Southwest border to fortify fencing to keep out large groups of Central American immigrants seeking asylum in the U.S. are no longer needed and will start going home this week, an Army general said Monday. The move is certain to stoke criticism the deployments were a stunt by Trump to whip up anti-immigrant sentiment among Republican voters and get them out to the polls for the midterm elections. Army Lt. Gen. Jeffrey Buchanan told Politico on Monday that Army and Marine engineers have installed about 75 percent of the concertina wire, shipping containers and concrete barriers at ports of entry they had planned to install. “Once we get the rest of the obstacles built, we don’t need to keep all those engineers here. As soon as I’m done with a capability, what I intend to do is redeploy it. I don’t want to keep these guys on just to keep them on,” Buchanan said. Trump repeatedly said without proof at election rallies around the country for Republican candidates there were terrorists and gangsters within the caravans of immigrants headed to the U.S.
“Do you know about the caravan? I think the Democrats had something to do with it. But they made a big mistake because people are starting to see how bad it is. That caravan is an assault on our people. There are some very bad people in that caravan,” Trump said at an Oct. 22 rally in Houston to drum up support for Senator Ted Cruz’s re-election bid. Trump said on Halloween he would deploy up to 15,000 troops to the border. But Buchanan told Politico all the troops should be home by Christmas and engineering and logistics units will be the first sent home as they finish building base camps and hardening ports of entry for the Border Patrol. Most of the deployed troops are unarmed as federal troops are barred from making arrests on U.S. soil. 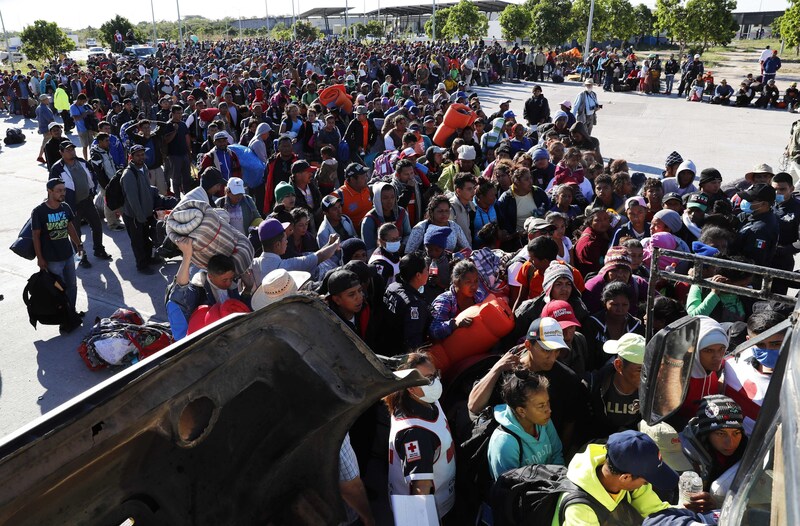 According to the United Nations, there are three caravans made up of 4,600, 1,050 and 1,500 immigrants from Honduras, El Salvador and Guatemala working their way north through Mexico. Members of the first group, which includes more than 400 children, have started arriving in Tijuana, across the border from San Diego, California. U.S. Customs and Border Protection agents temporarily closed northbound traffic lanes and pedestrian crossings at the San Ysidro port of entry in San Diego on Monday so troops could install new portable barriers topped with razor wire, the BBC reported. The San Ysidro port is the nation’s busiest, through which 110,000 people enter the U.S. every day. Buchanan told Politico the government could close other ports of entry, but he does not expect it will be necessary and would be a last resort because it would stop the flow of trade from Mexico into the United States. “If CBP have reliable information that one of their ports is about to get rushed with a mob, or something like that that could put their agents at risk, they could ask us to completely close the port,” Buchanan said. Buchanan said helicopter pilots, medical personnel and small units of engineers who can help Border Patrol agents halt traffic at ports of entry will stay at the border as their fellow soldiers are sent home, though they will not stay for long. “Right now this is a temporary mission and we’re tasked to do it until the 15th of December,” he said.